Start Display Assistant by selecting OfficeOne Display Assistant | Display Assistant menu item from Windows' Start menu. The Display Assistant window shows a list of windows on your desktop across all displays. The window list is "live" - it will update itself when you open a new window or close an existing window. It will even update itself when a window changes its title. 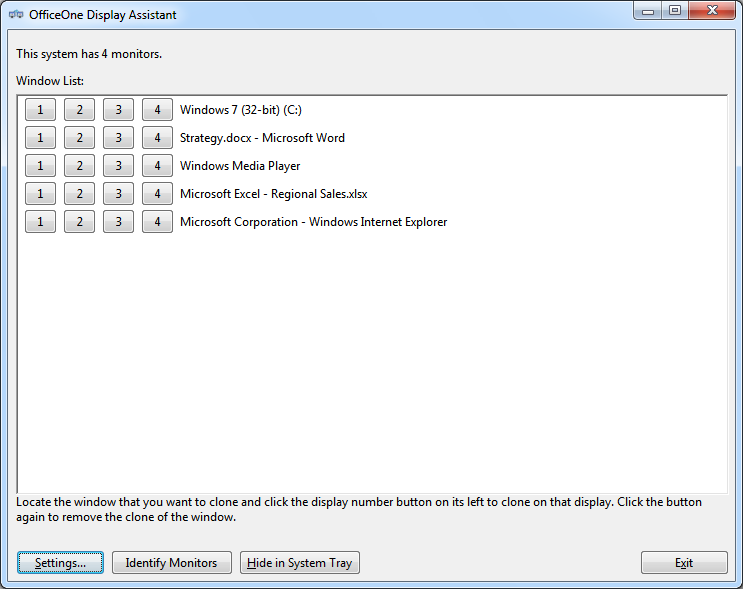 You can clone any window from this list to any of the connected monitors by clicking on the numbered button on its left. For instance, you can clone window with title "Microsoft Excel - Regional Sales.xlsx" from the above list on monitor 2 by clicking on monitor number 2 on its left. You can even clone the window on multiple monitors. For instance, in the above example, you can clone "Strategy.docx - Microsoft Word" on display 3 and 4 by clicking numbers 3 and 4 on the left to it. If you have Presenter View on monitor 1 and slide show on monitor 2, you can now clone the slide show to monitors 3 and 4 to have the same slide show display on 3 monitors. The Settings button shows the settings dialog box that allows you to setup automatic cloning of windows of applications. After setting it up, all existing and new windows of selected applications will be automatically cloned to the chosen displays. The Identify Monitors button makes Display Assistant identify the monitors. You will see the monitors display the numbers as seen by Display Assistant. The Hide in System Tray button hides the Display Assistant window and creates a new icon ( ) in Windows System Tray (next to the clock). You can access Display Assistant by clicking this icon. The clone window occupies the full screen and shows the window zoomed-in. Click/tap on the clone window to show your window in its original size. Click/tap on it again to zoom in again. Note that the clone window is a non-interactive clone.